Playing the United Kingdom for years now I finally started to build a new axis Flames of War army. 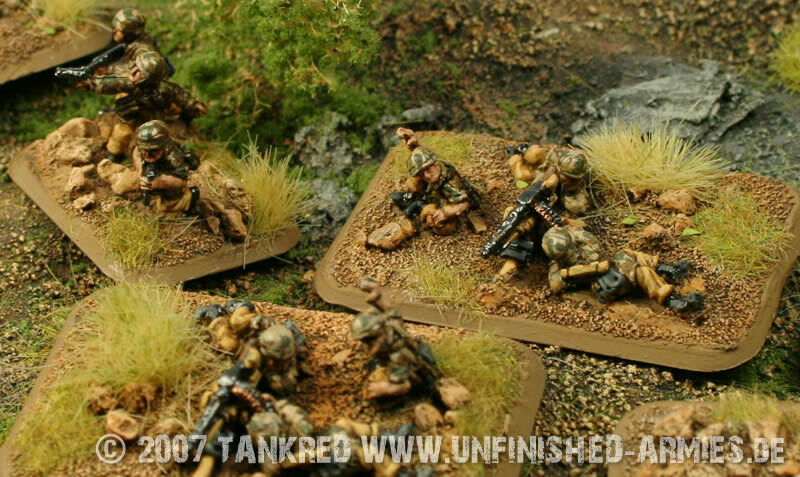 To have an ideal opponent for my british forces painted for the italian theatre I have chosen a Fallschirmjägerkompanie. I start to show you my efforts with a heavy Fallschirmjäger MG Platoon although the first platoon to be painted was a Fallschirmjäger Platoon. Usually playing a british Motor company I just could not imagine that the germans have more than 6 teams in a platoon. So I forgot to glue and paint three teams of my first Jäger Platoon, I will show it soon. I decided to paint all teams with a splinter camo smock and tropical trousers. Many pictures from italy show that kind of combination for italy 1943 and I think it really looks good. I wanted to paint this army somewhat quicker than my british army. Therefore I changed the grade of detail. Moreover I wanted to paint without Blacklining. I like Blacklining on 15mm models but on the other hand I want to test how realistic an army can look if you paint in a different way. In order to differenciate between platoons I painted little platoon markings on the bases as well as Luftwaffe rank insignia on the command teams. The markings are the same the platoon´s weapon container is painted with. Although the italian theatre saw not many jump actions I painted them since I would love to play the Death from above mission. The marking itself is taken from my imagination since I only found pictures showing parts of the weapon containers. If somebody can provide some information I would appreciate. Finally I made some battle markers to replace the plastic markers with text on them. The “Frankfurter Schule” i.e. the spirit of wargaming in my home town once told me that there should be no disturbing elements on the gaming table. I liked that idea from Decebalus and Tellus and finally made Models for “Gone to ground”, “Dug in”, “Moved at the double” and “Pinned”. Currently I work on the second Jäger Platoon and on an Marder II Platoon.